Infuse your modern living room with fresh, contemporary style and everyday practicality with the beautiful Oliver Coffee Table by Eurostyle. This modern coffee table features a classic, contemporary design that will blend harmoniously into a variety of design and color schemes while elegantly opening up a room. The table's high quality construction includes a solid chromed steel frame that ensures strength and stability and an oval-shaped, 60mm-thick wood top that's durable in design and elegant in style. 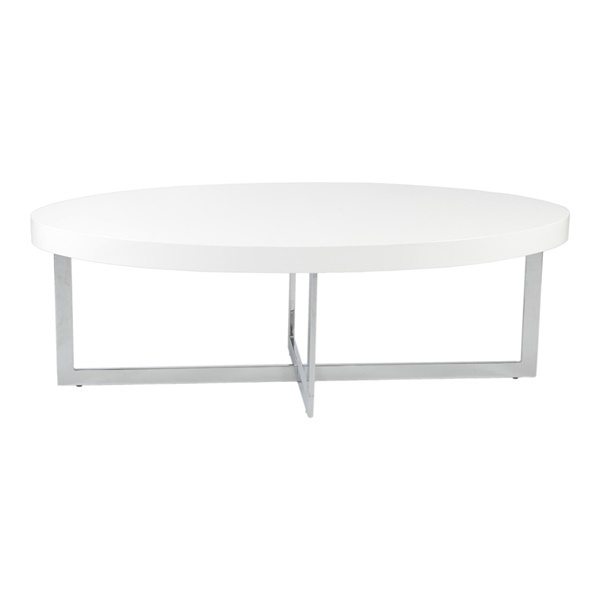 The Oliver Coffee Table is the perfect complement your contemporary d�cor. This table is not a solid wood top. These tables are made using a real wood veneer. The small size of this table weighs 37 lbs, and the large size weighs 48 lbs.